BLANCO, the German manufacturer of finely crafted sinks and faucets, launches its innovative dual mount LIVEN Laundry Sink – the perfect sink for a design-inspired laundry room. LIVEN comes in 8 trending SILGRANIT® colors with a deep, functional bowl that resists heat, stains, and chips. The LIVEN Laundry Sink is made of BLANCO’s patented SILGRANIT® material and features a generous radius on each of its corners; making it as easy to clean as it is durable. This innovative laundry sink is 25×22 inches – a perfect fit for compact laundry areas. An extra-deep 12″ bowl, perfect for soaking, and space-saving basket designed to fit on top of the sink make any dirty job a breeze. The LIVEN Laundry Sink will be offered in all 8 SILGRANIT colors and offers an on-trend rectangular shape. With multi-purpose installation, the dual mount LIVEN can be installed under or over the countertop for added convenience. For three generations, BLANCO has quietly and passionately elevated the standards for luxury sinks, faucets, and decorative accessories. Proud of its European heritage and award-winning German engineering, BLANCO is steadfastly committed to their tradition of high quality, innovative design and unsurpassed service since 1925. Dedicated to quality without compromise, every sink is closely inspected many times before it receives the BLANCO name. 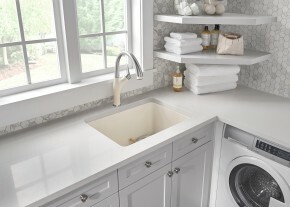 A remarkable history of firsts emphasizes BLANCO’s zeal for innovation including the first stainless steel sink to achieve a 10mm radius –STEELART® – the first to market colored hard composite sinks in North America – BLANCO’s pioneering MicroEdge™ technology with its virtual flush mount edge – and the first apron front sink in composite granite. BLANCO has a long tradition of environmental stewardship and their production facilities operate to strict DIN EN ISO 14001 environmental performance standards. BLANCO is the brand of choice in the luxury sink and faucet category for its unparalleled quality and an inspirational breadth of design possibilities. From the precision craftsmanship and artistic creativity of its STEELART brand to the stunning durability of its groundbreaking SILGRANIT® collection, BLANCO has proven that the sink is far more than a mere functional element in the kitchen. Since 1994, BLANCO has been a member of the Caux Round Table (CRT), an international network of principled business leaders and companies working to promote a moral capitalism.